The faculty of the University of Washington face a momentous decision: whether or not to unionize under the Service Employees International Union (SEIU) at this time. Under state law, no faculty member or group can opt out: we are either "all in" or "all out." Thus, it is critical for each of the 6,000 faculty members who would be impacted to explore the cases for and against unionization and to take a position. At least two websites present the case in favor of unionization under SEIU: www.depts.washington.edu/uwaaup/wordpress/ (a website created by the UW chapter of AAUP) and ﻿www.uwfacultyforward.org﻿ (a website created by SEIU). The UW Faculty Senate website includes links to information pro and con: www.washington.edu/faculty/senate/issues/. The leadership of UW has created a website summarizing arguments against and including a great deal of factual information: www.washington.edu/informedchoice/. The website you are now visiting - www.uwexcellence.org - differs from the SEIU's "UW Faculty Forward" website in that it was created and is supported entirely by UW faculty. It offers you the opportunity to join more than 1,000 of your colleagues and register your opposition to unionization under SEIU at this time by adding your name to the list of those opposed if you so desire. Importantly, "Faculty Forward" is not unique to UW: it is a national campaign conceived, directed, staffed, and funded by the Service Employees International Union to unionize college and university faculty. If 30% or more of the 6,000 faculty members in the bargaining group (the composition of which is determined by state law, including tenure stream, WOT, research, instructional, part-time, and perhaps clinical faculty) sign a union card, an election will be held. A simple majority of those who choose to vote, no matter how small a fraction, would then determine the fate of all 6,000. If approved, the 6,000 faculty will be required to pay monthly dues to SEIU, be represented by SEIU, and be bound by the terms and conditions of contracts that SEIU negotiates. Unionization is essentially irreversible, because the decertification of a union, once established, is difficult and rare. It is important to note that the question is not whether each of us does or does not support the concept of represented labor. Rather, the question is whether it is appropriate for the some 6,000 members of the professoriate and instructional faculty of the three campuses of the University of Washington to be represented by SEIU. Current state law does not allow this group of 6,000 faculty, whose work activities cover a wide spectrum, to be disaggregated for purposes of representation by a labor union. There is nothing inconsistent with opposing SEIU unionization of the UW faculty at this time while supporting the concept of labor unions in general. The following section summarizes arguments opposing unionization under SEIU at this time. It is unlikely that any individual will agree with all of the arguments put forward by either side. But it is a hard reality that each of us must weigh these arguments, and decide whether to support or oppose representation by SEIU at this time. Sitting on the sidelines - leaving the choice to others - is not a responsible option! If, after considering the pros and cons, you conclude that on balance you are opposed to unionization of UW's faculty under SEIU at this time, we ask that you add your name to the growing list of faculty who oppose unionization. We also strongly encourage you to speak with your colleagues about the consequences of this decision. You can view the list of those who have registered their opposition, and register your own opposition, here. No premier research-intensive university in the U.S. - no true peer of the University of Washington, and no institution of a quality to which we aspire - has a unionized tenure-track faculty. If we unionize, we will stand alone among premier research-intensive universities, private or public. Why have campaigns to unionize tenure track faculty at our peers and our aspirational peers failed? And, if a unionized tenure track faculty is an advantage, why aren’t lesser institutions that have unionized racing ahead in the rankings? We argue throughout this website that unionization is likely to diminish our excellence by damaging the environment in which our diverse activities flourish. Absent compelling arguments in favor of unionization, why risk it? The cost of being the first among our peers to unionize (if it turns out to be a bad idea) could be very large! (It takes many years to build an outstanding academic institution, but with missteps, excellence can be rapidly lost. Imagine the negative consequences of losing key faculty members from across the campus as a result of unionizing.) If unionization does turn out to be a good idea, why not let some other institution prove it, then quickly follow suit? What’s the rush? Some faculty unions deemphasize merit pay and emphasize lifting salary floors and awarding across-the-board raises - antithetical to attracting and retaining outstanding faculty at a premier research-intensive university. A faculty salary study distributed by SEIU Faculty Forward via email and direct mail invited comparison of post-recession UW faculty salary raises to those at the unionized four-year regional institutions in our state. The relevance of such a comparison is dubious for many reasons, but beyond that, a careful fact-check (﻿here) revealed numerous errors and misrepresentations in the SEIU Faculty Forward study. Raises at the regional institutions were overstated. Raises at UW were understated. The corrected data do not support the SEIU Faculty Forward conclusion that “Unionized Faculty Emerged More Quickly From the Recession.” Instead, the corrected data yield a different and important conclusion: three of the four regional institutions distributed none of their raises on the basis of merit in the year picked by SEIU Faculty Forward for study, with all funds invested in lifting floors and across-the-board raises. For the year picked by SEIU Faculty Forward, UW distributed 60% of its new investment in salaries on the basis of merit. The salary distributions required by union contract at the regional institutions - put forward by SEIU Faculty Forward as a reason for UW to unionize - seem antithetical to attracting and retaining outstanding faculty at a premier research-intensive university. Contracts at unionized institutions often include additional provisions that would diminish our ability to support excellence. Excellence is what sets us apart. It is our paramount duty as faculty members to protect the environment in which this excellence flourishes. If we unionize, the bargaining group will be huge - some 6,000 - with incredibly diverse work activities on three campuses. Even a very large bargaining committee with extraordinary outreach is unlikely to reach contract terms that "make sense" institution-wide. The "binding contract" promised by SEIU Faculty Forward will instead be a straitjacket. Inspection of higher education union contracts elsewhere reveals a variety of terms that might reduce our flexibility, and thus damage our ability to support excellence; examples include detailed procedures for promotion and review, limits on the raise a faculty member can receive in a normal salary cycle, the requirement that out-of-cycle (retention) raises be reported to the union (with obvious intent to reduce their use), etc. For typical contracts, see Rutgers (www.rutgersaaup.org/contracts/full-time-faculty-tenured-tenure-track) and the University of Oregon (﻿www.uauoregon.org/cba/﻿). It will be harder to get things done at the University of Washington. Ample experience tells us that the involvement of a union adds a layer of complexity. Administrators on our campus will spend more time dealing with union representatives and less time helping the faculty to accomplish our goals. And it is simply a reality that the relationship of administration and union will be adversarial rather than collaborative. It is hard to imagine that this will not negatively impact administration-faculty interactions. There is no convincing reason to believe that a unionized faculty will lead to greater state support for the University of Washington. The national SEIU “Faculty Forward” movement is framed as a response to changes in higher education in recent decades, a prime example being declining state support for public institutions, and the attendant rising tuitions that limit student access. It is argued by SEIU that a unionized faculty will carry more clout in Olympia, leading to improved state funding for higher education, lowering student cost, and thus improving access to higher education. Many organizations, including our own university leadership and the unions that already represent the state's community colleges and regional universities, have lobbied Olympia for improved funding for higher education over many years. There is no convincing reason to believe that SEIU will be any more successful than the many others who have lobbied Olympia for greater support for higher education - and there are in fact reasons to believe that the opposite might be true. There is no convincing reason to believe that a unionized faculty will lead to greater federal research support for the University of Washington. SEIU Faculty Forward has asserted that unionization will lead to improved Federal support for UW research. This seems highly implausible. Aspects of shared governance at UW that are working well are likely to be negatively impacted by unionization. Particularly in moments when we do not individually "get our way" it is all too easy to overlook the aspects of shared governance at UW that are working well. Examples include the respect the administration has demonstrated for the authority of the faculty regarding appointments, promotions, merit and retention reviews and raises, and control of the curriculum. We - the faculty - decide who we hire. We - the faculty - decide who we promote. We - the faculty - participate in each other's merit reviews. We - the faculty - determine our curricula. We - the faculty - have a significant role in choosing our own departmental leadership, typically from among ourselves. It would be naïve to imagine that all of the latter would be beyond the scope of contract talks. Unionization supporters argue that unionization strengthens shared governance. It seems obvious, though, that the existence of a faculty union would reduce the range of topics on which shared governance would act, and that this would weaken, not strengthen, shared governance, especially in the long term. The union will sometimes have its own agenda. It would be a mistake to think of the union as representing your particular interests, or even the interests of only the faculty of the University of Washington. A union will have its own positions on a variety of issues in the academy. Examples of this can be found on the American Federation of Teachers (union) website: www.aft.org/highered/our-positions. At this site one can find the AFT positions on academic freedom, academic staffing, faculty diversity, federal legislation, etc. This may be especially true with SEIU, because of how little UW faculty have in common with current SEIU membership; see http://www.seiu.org/cards/these-fast-facts-will-tell-you-how-were-organized/what-type-of-work-do-seiu-members-do/. You should consider the possibility that the national union, its regional leadership, and the UW faculty will not always be in alignment on all issues, and the union is much, much larger than we are! It is the wrong time to unionize UW faculty. It is ironic that at this particular moment in history some faculty would consider unionizing. Both of the top leadership positions in our institution - President and Interim Provost - are occupied by long-serving, highly respected, and extraordinarily capable members of our faculty. The same is true of several of our Deans. It is an odd time to move to a less collaborative and more adversarial system. Shouldn't we give this administration a chance? Not only is UW the wrong place for unionization - this is the wrong time! SEIU is the wrong union. SEIU's experience representing higher education is limited. It is far from obvious that they would be the correct choice to represent us. SEIU describes its membership as working in Healthcare ("caregivers in hospitals, health centers, nursing homes, in-home care and in our communities"), Property Services ("janitors, security officers, maintenance and custodial workers, stadium and arena workers, window cleaners, and other workers who provide important services"), and Public Services ("local and state government workers, public school employees, bus drivers, and child care providers"). The UW AAUP chapter reported that SEIU was chosen because they were willing to fund the campaign to unionize. Learn more about SEIU here. Even those who vote “no” will pay, and be bound by the contract. 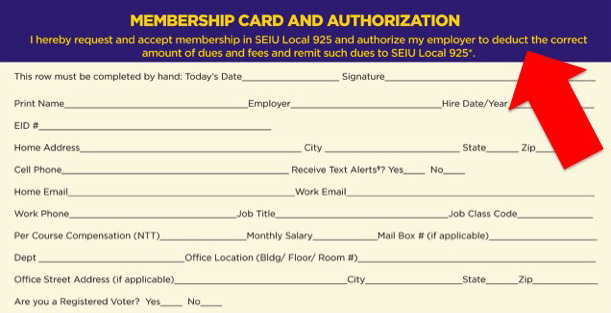 Under current state law, if an election is held and the majority choose to support unionization, all 6,000 who are members of the bargaining group (also defined by state law) will be required to pay monthly dues to SEIU, be represented by SEIU, and be bound by the terms and conditions of contracts that SEIU negotiates. State law does not allow any sub-group within the bargaining unit to withdraw. The fees are not inconsequential: a $1,000 per year union fee, instead invested at a modest growth rate of 3% beyond inflation, would yield over $60,000 in today’s dollars across a 35-year career. Collectively, we would pay around $6,000,000 per year to SEIU. A strike would force difficult decisions upon each of us. A key element of the bargaining power of a union is the threat that the represented workers will strike. Would you cross picket lines, or abandon an undergraduate or graduate class you were teaching? Would you cross picket lines, or skip your graduate student’s doctoral thesis defense? Would you cross picket lines, or miss the filing deadline for your grant proposal? Would you cross picket lines, or let down your research collaborators around the world? Representation by the SEIU would align the UW faculty with just one of the two major political parties, potentially compromising the institution's relationship with the public and the state legislature. The SEIU is closely associated with one of the two dominant political parties. In contrast, in our state both the public we serve and the legislature that funds us are divided about evenly between these two parties. Unionization of the faculty under SEIU thus has the obvious danger of compromising public and political perception of the University. SEIU's claim of increased effectiveness in Olympia seems particularly suspect, given this. Major issues that can and must be addressed are being addressed by existing mechanisms. In-state undergraduate tuition was reduced by 15% this biennium. (The 2015 session was one of the best in memory for UW, with $119 million of new funding, a 23.8% increase over the 2013-15 biennium.) A new faculty salary policy has been a priority for the Faculty Senate and is likely to be brought to the full faculty for a vote this spring. Efforts to add a faculty member to the Board of Regents date back to at least 2007, and UW had agreed to prepare faculty regent legislation for the 2017 session, joint with our five sister public institutions (several of which were not prepared to go forward this year). Many steps already have been taken, and more are planned, to address the very real concerns of contingent faculty (for example, Lecturers on contract) - a major focus of our December op-ed in the Seattle Times. UW's representation in Olympia and in Washington DC is strong and effective. "We UW faculty are independent entrepreneurs generating ideas, and we are accustomed to exerting a large degree of control over our working conditions. Unions have no experience with the kind of individual entrepreneurship involved in things like research grants. The rotation of department chairs, deans, and the like means that we are management, not just labor. (When their terms end, faculty return to their regular roles.) The one-size-fits-all mode that unionization implies would hurt our ability to respond to competitive pressures for faculty, especially in high demand disciplines. Unionization would cripple our ability in shared governance. I am strongly opposed to unionization but the SEIU seems a particularly inappropriate vehicle for unionization." "The diversity of the issues facing the faculty of the University of Washington are at odds with the idea of forming a collective bargaining unit. As highly educated professionals, I do not believe that we require the protections of organized labor and collective bargaining. Perhaps there are small subsets of the faculty that do have legitimate issues that have led them to believe they require this protection. These issues should be addressed within the existing governance of the faculty." "A union is often set up around the idea of seniority - the longest-serving people get the highest salary, are hardest to fire, get the biggest benefits, etc. This model will not work at an academic institution seeking to attract and retain talent (especially young talent)." "Why would we unionize when other the high-innovation places with which we compete haven’t?" "How can a single union successfully represent the extremely diverse UW faculty?" "Who actually does the negotiating with the university? National reps from SEIU? How do we know that their personal incentive structure and that of the national union are aligned with our own interests?" We recognize that not all of the above arguments are likely to resonate with you. We encourage you to consider the case for, and the case against. If you conclude that on balance you are opposed to the faculty of the University of Washington being represented by the SEIU at this time, please join many of your colleagues: sign the "Statement of Opposition to Unionization of the Faculty of the University of Washington." It's important to demonstrate that the majority of UW faculty does not support SEIU unionization at this time! Learn how else you can help, here.